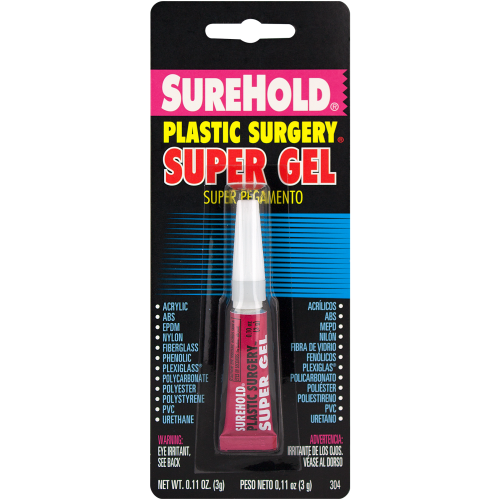 Specifically formulated to bond plastics more securely than other instant glue or gel. Engineered to “bite” into plastic materials. Not only can this bond more of today’s engineered plastics, such as acrylic, ABS, nylon, fiberglass, plexiglass, PVC, Urethane, it can also repair ceramics, aluminum, wood, metal, rubber, polymer clays, Makin’s clay, beads, gems, and more! This product is available as a thick gel formula for use on projects that call for thicker viscosity than most. *Retailers currently carrying our products may have a limited selection. Please contact your local retailer for product availability. For safety information, please refer to the SDS here.